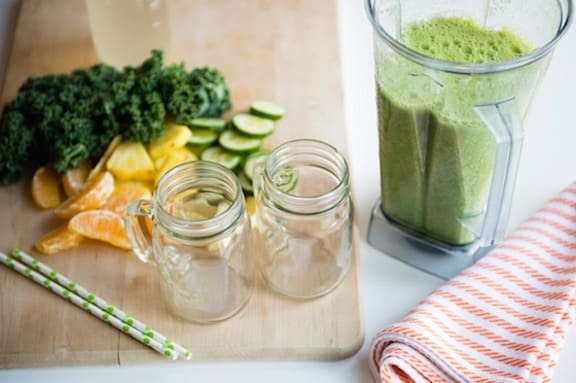 Simple Green Smoothies is issuing a deliciously healthful challenge: Do you think you can drink one green smoothie a day for 30 days? If so, your body will thank you. Join the challenge by going over to Simple Green Smoothies; sign up and get weekly emails with shopping lists, recipes, and tips. They’ll prove that green smoothies are super fast to make and also taste amazing. Here’s a sample — a kale smoothie that features hydrating coconut water, cucumber, and pineapple. The “bang” part comes from orange and lemon. Recipe and photo contributed by Simple Green Smoothies. Here's a delicious kale smoothie that features hydrating coconut water, cucumber, and pineapple. The "bang" part comes from orange and lemon. Blend kale, coconut water, and orange together until smooth. Follow @SimpleGreenSmoothies for free recipes, making it easy to have green smoothies apart of your everyday life!